Something that I believe is coming soon to the MMORPG industry is blurring of the line between browser and client MMORPGs. With improvements in Cloud technology and html development improvements, so called browser games are getting closer than ever to taking their gameplay to the next level. League of Angels is a new turn-based fantasy MMO that is fully playable in your browser, and this game shows us again why downloading games and installing them on your computer is an overrated thing. 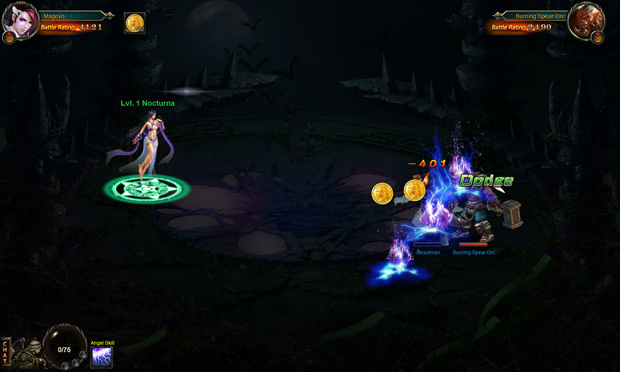 League of Angels is surprisingly enough a game about Angels! Yeah I bet you didn’t see that one coming, but it is true; these Angels will protect you with their life and fight on your side. Right from the bat you are paired up with an angel that believes in you, thinks you are the hero and straight away the game builds a setting where your level 1 novice is still a force to be reckoned with. When you have done the simple intro part of the game, you are given a choice of what class you want to play and what gender. Unfortunately there are not too many choices, and in fact only two right now, but I’m sure there will be more in the future. It’s a pretty simple choice between warrior and mage until then. Many of these browser games really have a proactive interface, and just like in League of Angels there are many flashy icons telling you that you have won something and are able to get your daily loot and stuff of that nature. It’s like receiving an email from a Nigerian prince telling you that you have won a million dollars. Sure that’s nice and all but I prefer a clean interface with nothing flashing unless it is really important. I tend to miss some of the more important interactions purely because it’s such a mess. Rather early in the game you are taught that your gear and level is really important when you are picking fights with someone else. Even when trying to slaughter monsters in the first couple of quests, you’ll find the power gap can be huge without the maximum gear on your character. If you fall in battle they’ll even throw a message your way alerting you that gear can be upgraded with better bonuses, or better gear can be crafted (and then further upgraded). If you have played other Asian MMORPGs or know their culture, you know they believe in prioritizing features most western gamers don’t care for. Expect to spend plenty of time focusing on horoscope and zodiac elements if you want to maximize your progress. Like I said, we westerners do not really think much about astrology, yet it’s all the rage in Asian MMORPGs right now. I would have rather seen something else but it at least adds some gameplay that would be better than nothing. Moving onto the most important thing of a MMORPG, the combat! Unfortunately this is also a lackluster thing in League of Angels. Even though it is advertised and considered a turn-based game, there aren’t many opportunities to actually enact strategic decisions. Each side does attack in turns, but unfortunately it does this automatically, and I would love to have more skill-based interaction to alleviate some of the emphasis on gear rating. The game seems more concerned with the quest of character improvement than what you can accomplish with your character, and the majority of your time will be spent tracking down and acquiring special angels. I do think that I might sound too negative right now, bashing only on the bad sides of a game. The game also has many positives sides about it. 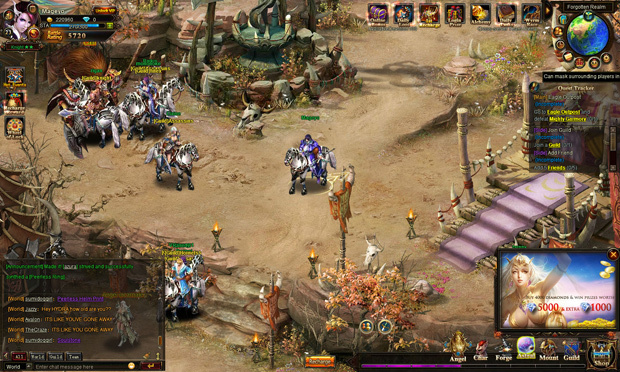 For a browser game, the game is actually really beautiful and the textures are of high resolution. 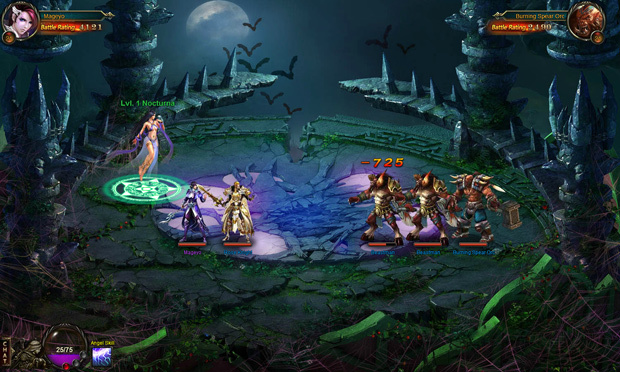 When fighting people and monsters, you will see a lot of different visualizations and spell effects. And people that are really into crafting will definitely love this game. There are a ton of possibilities to make weapons and gear upgrades and crafters will have a stark advantage over those who don’t dabble in a craft. There’s a plethora of shiny mounts to collect and plenty of heroes you can acquire to improve your team composition in power and effectiveness. For the fanatics like me that like to fight against other people, there is also an arena mode that lets you match up against people from your same level so you can get to know your character and foes even better. 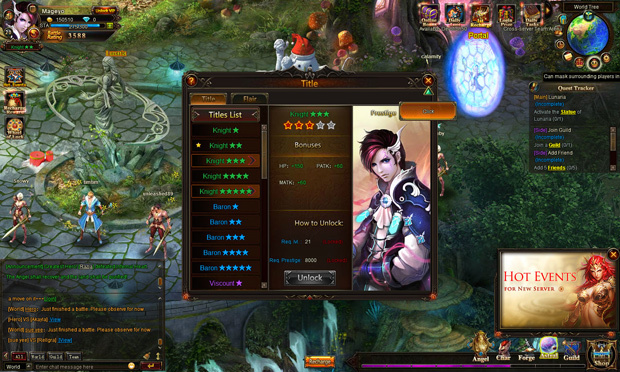 League of Angels is still in closed beta, and that can be seen in the game itself. I do not want to sound too negative, but I do think the game has some patching to do before it fully releases. The game’s total content is lacking, and what is there could use some tweaks. Some areas clearly shine and showcase how far browser titles have come in the past half a decade, and it’s worth checking out just to see the visuals in action. Casual gamers looking for low maintenance progression might find the overall experience quite enjoyable. For the real turn based fans, I am not sure if this game is worth the try since everything is automatically done. Either way it’s free to try so doesn’t hurt to give it a shot.